The Latin American hedge fund industry has continued to provide remarkable performance and growth for hedge fund investors over the years with the Eurekahedge Latin America Hedge Fund Index up 14.5%1 on an annualised basis since December 1999 and total assets under management (AUM) of the industry currently standing at US$60.8 billion. Since the start of the new millennium the Latin American hedge fund industry has witnessed tremendous growth, both in terms of number of funds and AUM. During this time the total number of funds in the industry has increased from just over 100 to nearly 400, while AUM has witnessed even more impressive growth. 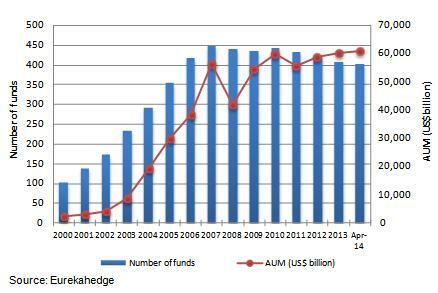 As at end-2000 total AUM in Latin American hedge funds stood at US$2.5 billion, while this figure stands at US$60.8 billion as at end-April 2014. The industry witnessed some losses and redemptions during the financial crisis, amid falling equity markets globally and heightened volatility across different asset classes. Total AUM fell below the US$40 billion mark in 2009 as managers suffered some losses while investors withdrew substantial capital from the funds. In comparison to other regional hedge funds, the Latin American sector performed admirably through the financial crisis – the Eurekahedge Latin American Hedge Fund Index declined by only 5.87% in 2008 while the average global hedge fund lost 9.66% during the year. During the global financial crisis, Latin American hedge funds also witnessed some negative returns and redemptions, although not on the same scale as global hedge funds. Assets under management in the industry declined to US$39.3 billion by March 2009, but have since posted a remarkable recovery.